Chapter one of the tutorial introduces Ontology Web Language (OWL) to business and the beginning ontologist. The example “Black Rock manages Emerging Markets ETF” is a good introduction to FIBO. Getting Started continues with step-by-step instructions for ontology editor, Protégé and query tools looking at Legal Ontology classes. 4. 4 Finance can master the compliance challenge. https://finregont.com © Jayzed Data Models Inc. 2016 Financial data, regulations, reports, and metadata can be stored in a uniform way. The Ontology Web Language (OWL) defines the semantics of concepts, their relationships, and axioms. Compliance crosses the domains or Finance and Legal. We select the best domain reference ontologies. 2 http://www.edmcouncil.org/financialbusiness 3 http://www.estrellaproject.org/ “The Financial Industry Business Ontology (FIBO) is a collaboration between the Enterprise Data Management Council (EDMC) and the Object Management Group. The EDMC leads design in collaboration with major Financial Institutions. OMG provides governance and publishes FIBO as a formal standard.”2 “The Legal Knowledge Interchange Format (LKIF) models legal rules of the kind found in legislation and regulations.”3 We populated LKIF with the Code of Federal Regulation (CFR) and the United State Code (USC). We populated LKIF with Code of Federal Regulations and US Law. 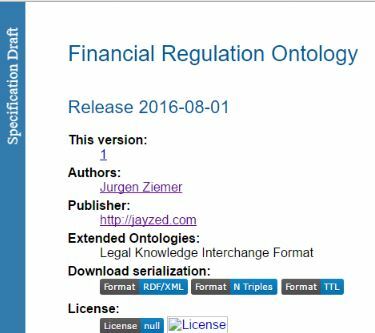 The Financial Regulation Ontology (FRO) extends and aligns the two domain reference ontologies. Extensions define subclasses to specific financial and regulatory data. Ontology Alignment establishes the relationship of equivalent concepts in FIBO and LKIF. It enables queries and reasoning across the domains. 6. 6 The first chapter introduces Ontology Web Language (OWL) to business and the beginning ontologist. The example “Black Rock manages Emerging Markets ETF” is a good introduction to FIBO. Getting Started continues with step-by-step instructions for Ontology Editor, Protégé and Query tools. FRO foundations explains the core classes relevant to regulatory compliance. The chapter shows how to populate FRO from XML files for law and regulations. The details of LKIF Legal Document are mainly for government agencies, who want to make correction or add more regulations and laws. However, loaded content is basis for Legal reasoning in chapter three and process and design is similar for all data sources. All metadata, mapping, and lineage are stored within the ontology Inferencing is the process to derive new knowledge from asserted facts. The FRO example infers, whether an Investment Funds must register with the Securities & Exchange Commission (SEC). We start with a deep-dive into LKIF Legal Expressions and how FRO defined classes encode SEC mandate and exceptions. https://finregont.com © Jayzed Data Models Inc. 2016 2 Loading the law 3 Legal Reasoning1 Introduction Implementing Financial Regulation Ontology This slide-doc tutorial explains FRO, LKIF and FIBO design, and how to extend the ontologies for data population. We recommend to study the text end-to-end. Even beginner sections show finance related classes and data. 16. 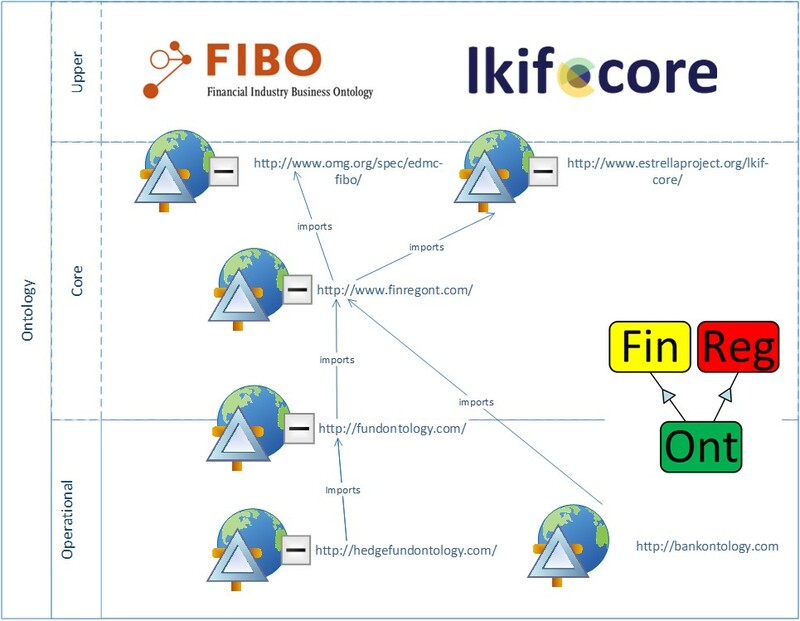 16 Operational ontologies import FinRegOnt As a single import for Finance Subdomains FinRegOnt.com extends and aligns the two domain reference ontologies. Extensions define subclasses to specific financial and regulatory data. Ontology Alignment establishes the relationship of equivalent concepts in FIBO and LKIF. It enables queries and reasoning across the domains. FinRegOnt is populated with the full text of relevant Code of Federal Regulations and United States Code. Operational ontologies for regulatory compliance import FinRegOnt. BankOntology.com covers Comprehensive Capital Assessment and Review (CCAR) and Bank Holding Companies. FundOntotlogy.com overlaps core and operational layers. It has legal reasoning common to all investment vehicles. HedgefundOntology.com is specific for alternative investment fund compliance. * Over 150 banks for example have licensed the IBM Banking Data Warehouse model 6 http://hedgefundontology.com/ https://www.finregont.com/ imports http://fundontology.com/ include http://bankontology.com Imports imports https://finregont.com © Jayzed Data Models Inc. 2016 Financial Regulation Ontology is a set of related domain ontologies. 18. 18 Legal Knowledge Interchange Format (LKIF) The European project for Standardized Transparent Representations in order to Extend Legal Accessibility (Estrella, IST-2004- 027655) aims to develop and validate an open, standards-based platform allowing public administrations to develop and deploy comprehensive legal knowledge management solutions, without becoming dependent on proprietary products of particular vendors.3 “LKIF is intended to model legal rules of the kind found in legislation and regulations.“9 It is the main deliverable of the ESTRELLA project. LKIF is an Upper and Core ontology. The lead architect, Rinke Hoekstra made the OWL files are available on GitHub: https://github.com/RinkeHoekstra/lkif-core We will cover LKIF implementations for Traffic and Contract law in the chapter on Legal Reasoning. https://finregont.com © Jayzed Data Models Inc. 2016 The Legal Domain has several available reference ontologies. Nuria Casallas, “Legal Ontology Engineering”1 provides a good introduction and comparison. We believe LKIF is the most advanced and strongest for Legal Reasoning. 22. 22 Using an ontology editor Topbraid Maestro “TopBraid Composer™ Maestro Edition (TBC-ME) combines world’s leading semantic web modeling capabilities with the most comprehensive data conversion options and a powerful Integrated Development Environment (IDE) for building semantic web and Linked Data applications.”12 This is our main tool. FRO’s XML and Database imports, transformation rules and orchestration are implemented with Maestro. Most screenshots in this tutorial show TopBraid. Protégé Desktop We use Protégé for proofing – to make sure the ontology opens and passes Reasoner integrity checks. Protégé is free and thus the best way to get started. Download Protégé at http://protege.stanford.edu/products.php#desktop-protege and follow the installation instructions http://protegewiki.stanford.edu/wiki/Install_Protege5 . To get familiar with OWL concepts and the tool, we highly recommend the “Pizza” tutorial from Manchester university: http://owl.cs.manchester.ac.uk/publications/talks-and- tutorials/protg-owl-tutorial/ https://finregont.com © Jayzed Data Models Inc. 2016 Ontology editors are applications that assist in the creation or manipulation of ontologies. They also provide an inference engine (Reasoner) and query interface. We use TopBraid, a commercial editor and Protégé for FRO. 23. 23 First steps with FinRegOnt in Protégé Launch Protégé and select File->Open from URL… The root ontology file https://finregont.com/fro/Investment_Adviser_Act_USC_CFR.ttl Is a good starting point. It is populated with sections from the Code of Federal Regulations and United States Code relevant the Investment Adviser Act. https://finregont.com © Jayzed Data Models Inc. 2016 The tool loads the Investment Adviser Act ontology file and recursively all included ontologies. This may take a few minutes depending on your download speed. The FinRegOnt website fro directory has all ontology files. There are subdirectories for Reference (fro/ref/), Code of Federal Regulations (fro/cfr/) and United States Code (fro/usc/). The Query directory (fro/query/) contains the SELECT statements used in this tutorial. 24. 24 First steps with FinRegOnt in Protégé https://finregont.com © Jayzed Data Models Inc. 2016 The active ontology tab displays header information, statistics and the list of includes. The Ontology header windows shows the active ontology and it’s Annotations. Here the SKOS definitions of the files. Annotations, are metadata properties attached to ontology, classes and properties. (Everything is a triple) . The Metrics window lists statistics of the active plus included ontologies. The bottom window, Imported Ontologies shows the direct and indirect imports. Investment_Adviser_Act_USC_CFR.ttl includes FRO_CFR_Title_17_Part_275_Section_1-7, a data ontology file with the Code of Federal Regulations. 25. 25 The Entities tab has windows for class and properties https://finregont.com © Jayzed Data Models Inc. 2016 The entities tab has a navigator window for the class and object hierarchy. Note that all top-level classes, directly under owl:Thing are LKIF. Financial Regulation Ontology extends LKIF with United States Code (USC) and Code of Federal Regulation classes. We will see FRO subclasses of LKIF in the followig pages. Tip: Regulatory Document classes are lkif- expr:Medium. Lawmakers, supervisors are lkif- action:Agent. Expand the “+” sign in the Navigator to drill down. 32. 32 SPARQL query results https://finregont.com © Jayzed Data Models Inc. 2016 The result set shows the record for Code of Federal Regulations Title 12 Part 252 – enhanced prudential standards. You can look up the ontology documentation and explore variations of the query. Columns in the Result tab are binded variables in the query: “?part fro-cfr:hasPartText ?part_text” asks the query engine for all resources that are domain and range of the hasPartText data property. “?section fro-leg-ref:divides ?part” is the object property join from CFR Part to CFR Section. The query asks for hasSectionNumber and hasSectionSubject of the CFR Section. Everything is a Triple! 33. 33 SPARQL query by example https://finregont.com © Jayzed Data Models Inc. 2016 The QBE tab shows the query’s graph. Arrows depicting the properties connect circles for the variables. The Schema explorer box on the right hand side shows classes and properties defined in the ontologies. In our example Code_Federal_Regulations.ttl graph defines the CFR classes for Title, Volume, Part, Chapter, Sections etc. To modify the query, we drag additional entities into the diagram.